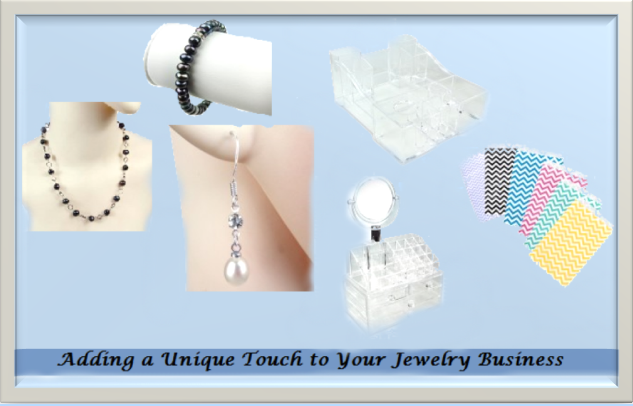 Anyone who is passionate about jewelry and has the skills plus the money to start a business can easily do so nowadays. Thanks to the Internet, even people who don’t have a big capital can start a business online either by joining an online marketplace or by opening an independent online store. This trend opened a lot of opportunities for entrepreneurs all over the world and gave way for more exciting jewelry collection and creations. However, it also challenged anyone who wishes to establish a jewelry business to bring something new on the table and find new ways to present jewelry to the customers. Let’s face it - starting a business is easy; staying in business can be very difficult. Especially with the stiff competition in the market today, success can only be achieved if you know how to bring value to your customers. If you’re aiming to open a jewelry store, how do you plan to make your business stand out? Below are some of the things that you can consider. When customers have too many choices on where to spend their money, they are most likely going to the brand that treats them the right way and care for them the most. Before starting your business, ask yourself what you can do for your customers that other companies don’t. Determine the need of your prospective buyers and think of an effective and efficient way to address it. For example, a lot of people buy jewelry as gifts to their loved ones, especially during Holiday season. Create a section in your store where you can display jewelry for different occasions and give valuable suggestions to your customers about possible gift ideas. You can also offer free personalized packaging and with a simple greeting card where they can write notes for their friends or romantic partner. Establishing your authority in your chosen niche is also a great way to make your name known in jewelry industry. But before you give expert’s advice, make sure that you are well informed about the things that matters to your customers – like diamond quality, different types of metals, and jewelry types for different occasions. Join trainings, seminars and forums to learn more about jewelry business. The more you understand jewelry, the easier it gets to give advice to your customers. Just remember to keep things tacky and avoid sounding know-it-all to gain the trust of your shoppers. When it comes to fashion, people are always looking for something new, something they haven’t experienced ever – or at least for a long while. As a jewelry retailer, it’s your job to look for wholesale jewelry suppliers who offer unique and stylish jewelry styles and designs so your customers can enjoy a different kind of fashion than the rest of the girls in your area. Keep your selections fresh by looking for online wholesalers and displaying your items in an eye-catching way. From creating an impressive jewelry display to giving the best customer service, it’s important to put something unique in your jewelry store. This way, your brand will get easily noticed by your customers creating more opportunities for your business. When it comes to displaying jewelry, you can find a lot of ways to showcase your products in retail stores or during trade shows. But as a jewelry seller, it is important to know which ones work well with a particular type of jewelry and how it can be used to highlight the details of a beautiful piece. One of the options in displaying jewelry that we don’t get to see a lot being used in jewelry stores is the metal wire necklace and earring display. This type of display works well with wire jewelry, beaded earrings, chain necklaces and stainless steel charm bracelets. 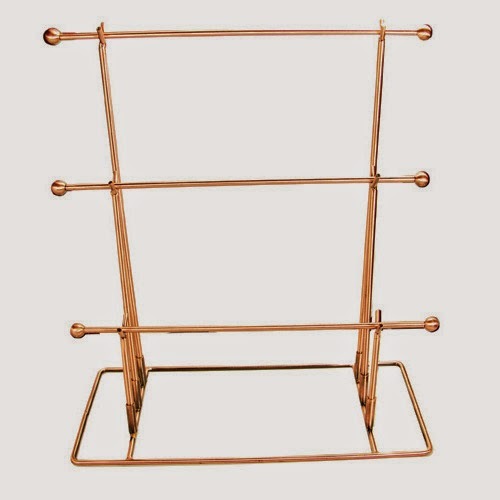 With its ability to carry multiple pieces at a time, using metal wire necklace display is definitely a smart choice in small retail store or trade show booth. It also comes in variety or styles and designs that can help highlight your products and can match the theme of your store decoration. 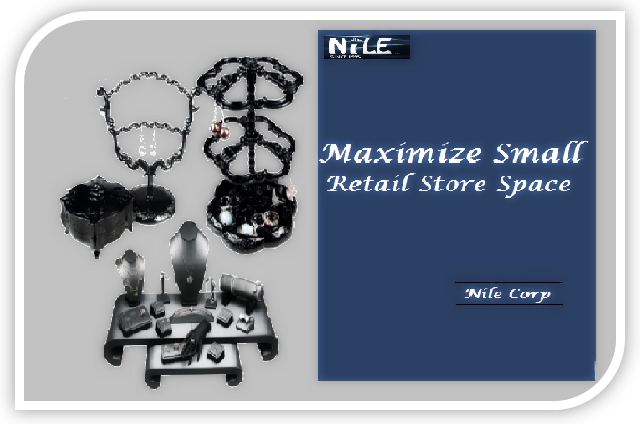 If you haven’t tried this display yet, here are some wire metal display from Nilecorp that you can choose from. This rotating display comes in black or copper color and has decorative coils at the top for eye-catching look. 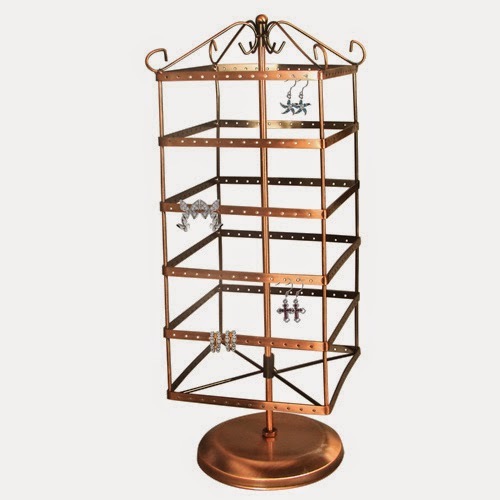 If your specialty is selling handmade earrings, this jewelry display is great for you as it can hold up to 96 pairs of earrings at a time. Some assembly required. Display your necklaces and earrings side by side with this combination display. 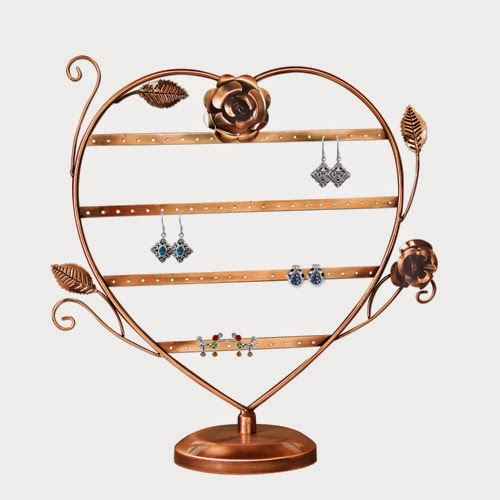 Ideal for 24 pairs of earrings and 10 necklaces, you can show off your jewelry in matching designs with this jewelry display. Highlight your dainty jewelry with this metal wire display in heart shaped outline. The decorative floral designs add elegance and style to your display. Hang your floral themed earrings and place it on top of a shelf or riser to make it more noticeable to your customers. The removal bars of this display allows you to replace remove an item easily. 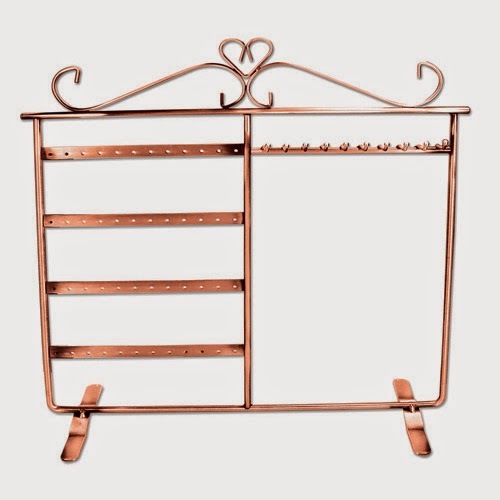 Perfect for displaying matching pearl necklaces and bracelets. And because this necklace display has removable bars, your customers can easily try it on and put it back afterwards. Check out other metal jewelry display at our website or follow us on Facebook for more display tips and jewelry business guides. One of the most challenging parts of establishing a jewelry business is finding the best location to showcase your products. Fortunately, selling jewelry and other accessories doesn’t need a large space. Even a small jewelry store can be very profitable as long as it’s in high traffic area where you can reach your target market easier. Having a small store space can have a lot of advantages, especially for startup entrepreneurs. It’s easier to manage and maintain compared to a large physical store. Plus, it’s also a lot easier to decorate depending on the need of your customers. Given the limited space of your jewelry store, it’s highly important to maximize the small space in your store so you can display the right items without cramping or overcrowding your boutique. Below are some tips that you must consider. Large tables, chairs and shelves can occupy a lot of space so always think twice before purchasing furniture for your retail store. Think about the right scale and size of your furniture so you can create a visually appealing store layout. Some store owners believe that displaying different items all at once increases sales opportunity and improve their chance to have better profit. On the contrary, putting everything on your necklace display can overwhelm your customers and can make it more difficult for them to come up with a decision. To create a desirable look, limit the number of products on display and position your jewelry in an appealing way. Remember space out your items to let each jewelry piece stand out. Instead of hanging decorative items, you can use your walls to attract the attention of everyone who walks into your store. You can find a lot of necklace Slatwall display and other wall mount displays that you can use to showcase your jewelry. Hang statement rings and chunky necklaces on your ways to save space. Customers love to roam around a retail store to look at different items that might fit their chosen outfit. Because of this, you have to make sure that your customers can walk around the store without bumping on furniture or each other. Whether you’re a startup or an established name in the jewelry industry, attending trade shows is still a great avenue to promote your products and gather useful leads for your business. If you really want to make the most out of every trade show you go to, it’s important to invest a lot of money, time and hard work from months before the event to the actual day on location. Coming unprepared will cost you a lot and may even affect your brand’s image. As soon as you have the schedule for your next trade show, start to plan your strategies on how you can ace your next event. Decide on which items to bring and what promotional activities you can do to bring more customers to your booth. You can also start buying the right ring or necklace display and stands then create plan on how to showcase your jewelry the right way. Are you planning to join a trade show or craft event anytime soon? We make a simple infographic to help in your preparation for your next show. Check out this Jewelry Trade Show Checklist for a hassle-free event.